Snorkelvacmaskin med temperaturkonrtollerade svetsar (Onpul system). maskinen körs via fotpedal. Med olika program kan man bestämma svetstider och vakuum. maskinen kan utrustas med olika typer av pumpar för att klara ev renrumsmiljöer. Maskinen kan utrustas med kodmärkare . 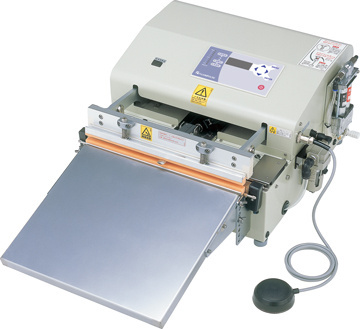 V-402 is equipped with the built-in compressor to generate vacuum as well as run the sealer's pneumatic functions. No separate compressor is not required and it is ready for use as soon as the power is turned on. Up to 10 work patterns customized by the user can be registered. By calling up a registered pattern on the microcomputer controller, the user can always perform a programmed work under the same condition. the film eliminates wasted energy consumption, improves sealing precision and minimizes wear and tear on the heating element and other parts. a. When overheating occurs (i.e., when power continues to be distributed to the heating element for longer than 4 seconds), the breaker turns off and the power is shut off.